Creatively, the last few weeks have been tough. Long story short, my work attracted unwanted attention. Suffice it to say, my creative energies bottomed out. The problem with that is that I have 3 writing projects that I can’t just put aside. I need to recharge. My method of choice lately has been adult coloring books. Hey, hey! Get your mind out of the gutter. I don’t mean anything like the Kama Sutra coloring book. Adult coloring books are simply books with designs that are often intricate. They take time to complete which is important because coloring time is somewhat creative but it is also relaxing and flexible. I can color by myself. I can color with my critique group. We even have coloring time planned for our next writer’s retreat in October. 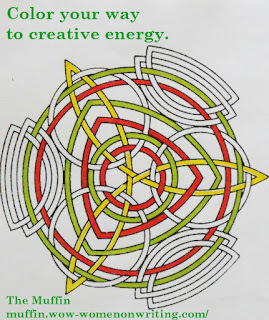 Even Carl Jung saw the benefits of coloring. He was a proponent of art therapy and recommended that his patients draw vaguely circular designs known as mandala. Jung recommended mandala because they represent wholeness. I don’t know about that but when I choose coloring pages, I am drawn to symmetrical designs. When I take my lunch break, I spend 15 minutes more at the table coloring. It relaxes me. It gives me time to play. As my mind wonders I often work out one or more writing problems. 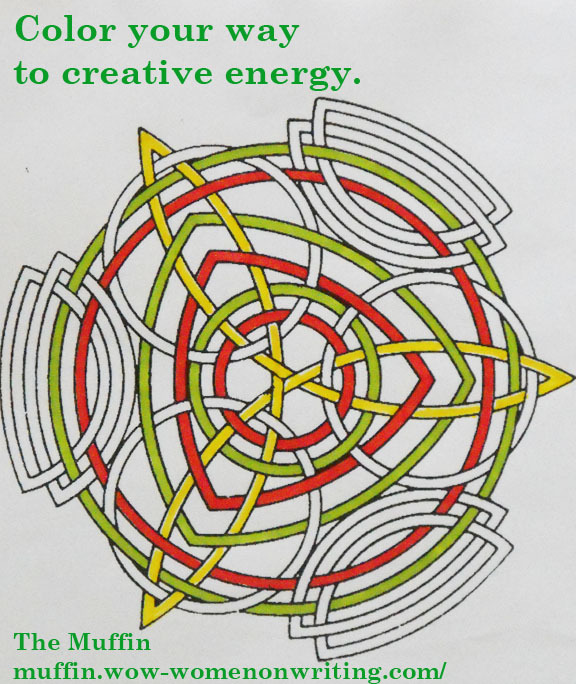 Coloring Pages for Adults has mandala patterns and others inspired by Celtic knots. Clip Art and Crafts has everything from the traditional mandala and text pages to animals and 3-D shapes. Color Pages for Mom has a category, “Churches Houses and Cities,” that I call architectural pages. These pages range from cityscapes to elegant interiors. Other popular categories include Paisley/Henna and Owls. Doodle Art Alley has word-based pages, kaleidoscope, abstracts, mandala and more. One of the good things about her selection is that they range from the fairly simple to the complicated. Doodle Art Posters may sound familiar. Remember the dime store posters with the black background? I love those and there is a whole selection on PhotoBucket. They even upload customer’s finished art. The next time you feel tapped out creatively, print out a coloring page, get yourself a glass of wine, and get ready to relax. By the time you’ve finished, you’ll be more relaxed and able to focus on your current project. I love Zentangle images BUT I think I've seen too many awesome creations. When I play like that, I get all "my stuff isn't as good." Not very relaxing at all. For whatever reason, I don't get that feeling when I color. I'm not saying I make sense; I'm just saying this is the way I am. I have to say that I've seen these books advertised a lot lately on TV and in some of the specialty catalogs I receive in the mail. I love to bake but the temps here are still topping 95. It has too cool off first. Music? It depends. If I need a break, music is good. But if I'm too tapped out, quiet is better. I don't go for pricey and I'm queen of the 40% off coupon. Funny how we each need something so different to recharge.